Sometimes you'll turn a corner in my house and stumble across something weird. For example, evidence that someone in the house buys crazy amounts of toilet paper. Do or do not, there is no why. It’s a very pleasing installation. Look at the symmetry! Awesome work. I would have snapped a picture, too. Claudia: I agree. Artistry ! This reminds me of a Pittsburgh quirk. Every where I’ve lived, when it is about to snow the TV people go stand in the grocery store to report that people go buy milk and bread before it snows. But, in Pittsburgh, the people buy milk, bread, and toilet paper. Which means that Pittsburgh residents either buy toilet paper in such small quantities that they can’t risk being snowed in for a couple of days, that they are always afraid each snow will trap them for much longer than a couple of days, or snow causes some kind of change to the metabolism of people around here. or snow causes some kind of change to the metabolism of people around here. I think they are worried about the effects of a pure milk and bread diet. It was mostly white bread, so I don’t think they’ll have that problem. Anyway, ever since they shut down all the liquor stores on Valentine’s Day because of a four inch snow fall, I always hit the liquor store before the grocery store. It occurs to me that rather than buying gold for all your doomsday needs, it makes a lot more sense to purchase and store inexpensive alcoholic beverages. I’ve seen people recommend food and toilet paper instead, but liquor has many advantages as a currency over 24-packs of Charmin. And, as opposed to gold, alcohol isn’t $1400 an ounce. …it makes a lot more sense to purchase and store inexpensive alcoholic beverages. That depends on your particular dystopia. Much of the cost of cheap alcohol is in taxes. Ff you have the collapse of organized society, then moonshine is everywhere and you would have been better off to store something else. Probably weapons and luxury goods (which would probably include toilet paper and expensive alcoholic beverages) would be best. These are what people with a surplus might want to trade for and what will be difficult to make until society rebuilds itself. For less complete disasters, which are more likely, holding cheap alcohol might help. If society is too badly damaged to provide a stable currency, but not too badly damaged to collect taxes, then 100 cases of cheap vodka would be a good bet. 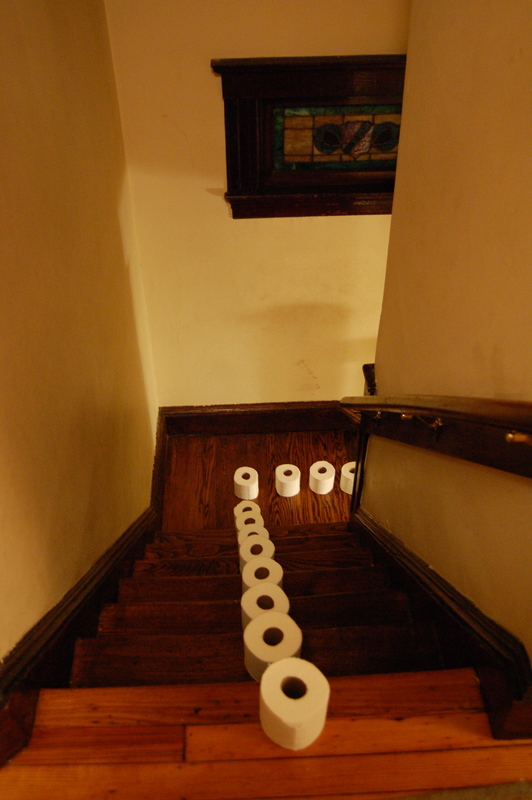 Looks to me as if someone said that it’s easy enough to take the toilet paper up, one stair at a time. Literal interpretations are so much fun! It was the mice, right? It’s an interesting (and somewhat skewed) version of the time that I went up to our roof deck and found that all the dolls were having a ball up there. I also managed to take a picture. Visual illustration of why that cruise ship with no toilets is unpleasant in the extreme?